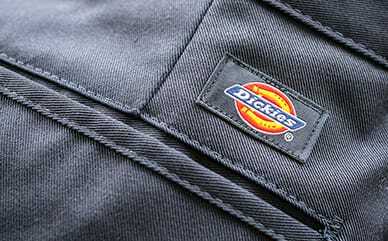 Dickies’ Girls' Flex Slim Fit Straight Leg Flat Front Pants are straight leg pants that fit slim through the seat and thigh. Great for the classroom and durable enough for the playground, these polyester/cotton pants feature a mechanical stretch twill fabric that lets her move how she needs to, while offering more durability and longevity. The moisture-wicking technology keeps her dry after running around, while the stain release and wrinkle resistance keeps her looking good. Another great feature is the adjustable FlexWaist® waistband that lets her adjust the size of her pants as she grows.